Here’s the latest news from Lundy Warden Dean Jones, covering the period 7th to 9th April. 7th April: A very dreich start to the day with thick mist and light downpours from first light. Fortunately the weather improved by mid-afternoon which opened the gates for the first proper pulse of Swallows (61) and Sand Martins (15). Collared Dove: One in Millcombe/Village area. 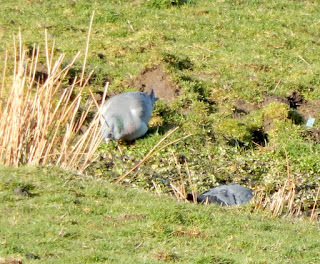 Stock Dove: Two feeding in Barton Field (see photo below) along with five Woodpigeons. Meadow Pipit: Small arrival of 94 birds to the South End (count composed of two feeding flocks). 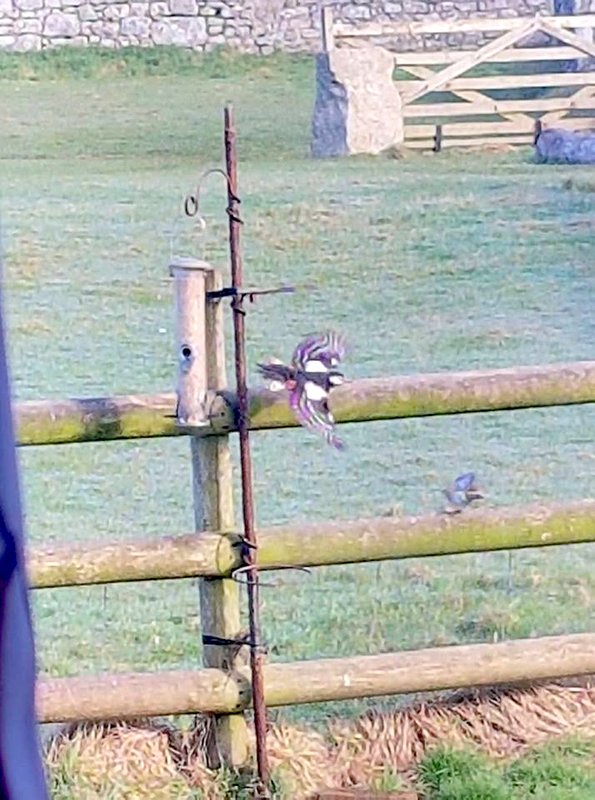 Pied Wagtail: Three feeding in upper Lighthouse Field alongside the Lundy ponies. Goldcrest: 15 scattered throughout Millcombe and the Village area. Chiffchaff: Seven from the South End and Millcombe. Willow Warbler: 10 from the South End and Millcombe. Blackcap: 12 males and four females in Millcombe. Pied Flycatcher: A stunning male busily feeding at the top of Benjamin’s Chair (see photo below) – the first of the year. 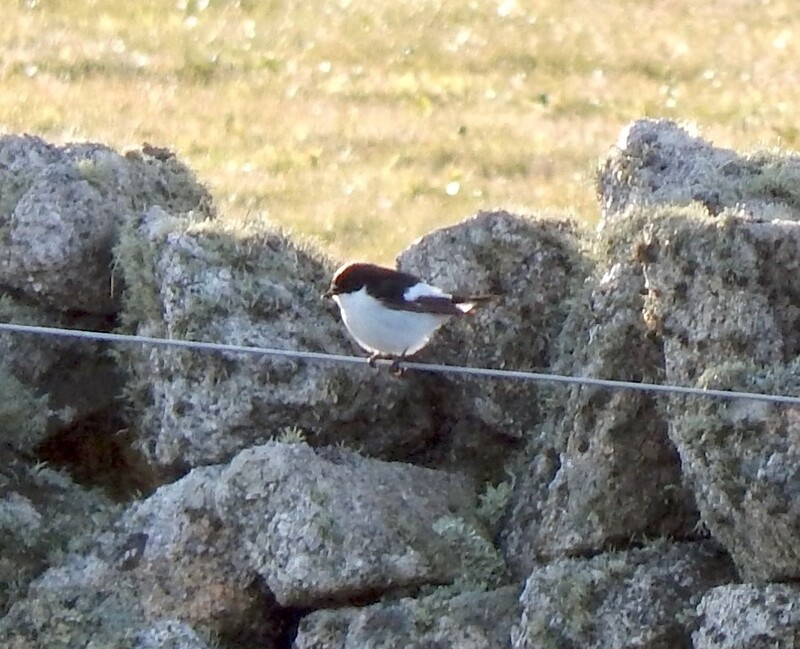 Stonechat: A male on the wall of the camping field. Wheatear: Seven along the south track. Song Thrush: One in Millcombe Wood. Linnet: Five (one in Millcombe and four in South West Field). No sign of the Treecreeper though the female Great Spotted Woodpecker was seen numerous times throughout the day from the Millcombe/Brambles area and once perched on a tree outside the Laundry room in the Village (super office tick that one! ), which the House Sparrows were really not happy about. Male Pied Flycatcher, above Benjamin's Chair, 7th April. 8th April: A beautiful sunny day with low winds – the first day the sun cream’s been out! Migratory species somewhat sparser. Great Spotted Woodpecker: The female bird still present in Millcombe Valley and seen numerous times throughout the day. 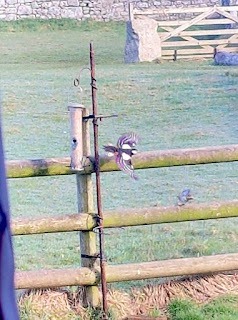 It also visited Sue Waterfield’s garden feeder throughout the morning period (see photo below). Sparrowhawk: One female past the Terrace in the late morning, seen whilst on a guided walk. Merlin: A female being harassed by Carrion Crows next to Old Light. Collared Dove: One in Millcombe. Feral Pigeon: A single bird, the first of the year. Puffin: 72 in Jenny’s in the late morning, counted mostly from the water. Goldcrest: 12, most of which were recorded from Millcombe and the Lower East Side Path. Swallow: 22 overhead throughout the day. House Martin: Five past Jenny’s Cove in the early afternoon. Stonechat: A male in South West Field (possibly the same bird from the 7th). 9th April: Weather similar to Sunday’s with the wind picking up in the late afternoon coupled with an obvious drop in temperature. The full Conservation Team (including our two new long-term volunteers) were out counting our semi-wild stock all day, which meant we were able to get some good counts of birds as we trekked the entire island. Unfortunately numbers of migrants were surprisingly low considering the super conditions for passage. Black Redstart: One singing loudly on the roof of Paradise Row first thing. Merlin: A female at North End. Peregrine: A total of seven, including a copulating pair and a young female. Feral Pigeon: One predated bird (possibly the bird from the 8th) found on the Terrace. Goldcrest: 20 scattered all over the island, including three at the North Light. Fieldfare: A predated bird found next to Halfway Wall. Wheatear: 38, the highest count yet this year, most likely an underestimate as birds along the West Side were surprisingly thin on the ground as the temperature dropped. Stonechat: One male in South West Field again.